After the termination of Nintendo’s first mobile app, many users have been left feeling lost as they depended qon the app as a means to cope with depression. However, one such user has yet to give up the fight just yet. Lin K has started a brand new petition on Change.org in the hopes that Nintendo will consider a Miitomo-like program that will allow users to modify their Miis and dress them up in outfits much like Miitomo did. The program would mostly like center around the Miifoto feature and allow you to take photos with your Mii and alter background or add them to photos on your device. Now, Nintendo have announced recently that they were going to launch a browser accessible feature on the My Nintendo website that will allow users to alter their Miis for their Profile Avatar. This doesn’t include clothing options and will focus only on the Mii’s facial and body features. I for one, would certainly welcome a Miitomo like program or app that would maintain the Miifoto feature if nothing else. If Nintendo could also transfer the outfits and backgrounds from Miitomo to this potential program, I would certainly download it in a heartbeat. Whether you are a fellow Miitomo simpathizer, or even if you aren’t, if you would like to support Lin K’s petition, please check out her Change.org petition. If you would like to know more about the petition and what Lin hopes to achieve, we have an overview below. 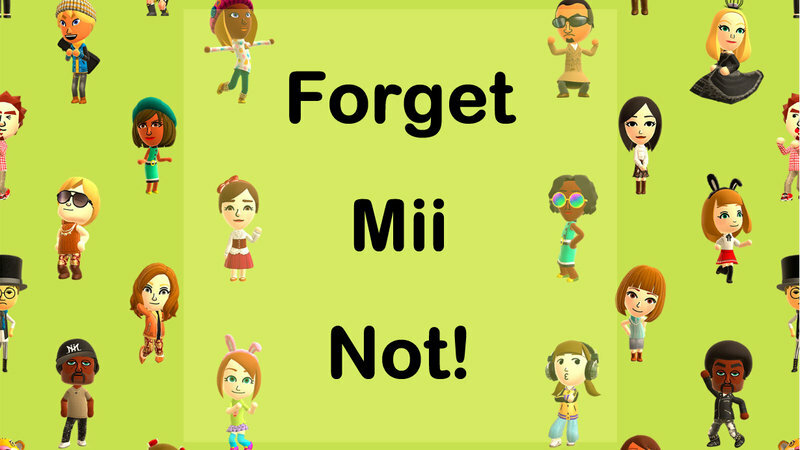 The Forget Mii Not Campaign! A new place for our Mii friends. What We Want: We are asking Nintendo to create a program where we can make and dress up Miis as well as create Miifotos. The Details: With the end of Miitomo, many of us have lost a very meaningful game. For many, it was a means of working through tough times in their lives. For others, it was about the relationships. Some enjoyed the creativity and imaginative play. Whatever the reason, Miitomo had a special place in our hearts. While Nintendo has announced that they will be creating a web-based program where we can make Miis, we’d like more. This petition is to ask Nintendo to give us a game where we can still make and edit Miis as well as dress them up and create Miifotos. They can make all the clothes and backgrounds from Miitomo available. We want this to be a more permanent solution, like a downloadable program. Something we can keep that won’t be terminated. This also wouldn’t require constant upkeep from Nintendo. We understand that Nintendo is a business first, and this needs to be in their interest, too. As they already had all this capability in Miitomo, it should only take minimal programming to turn it into a new simplified creative game. They could charge a small fee – something along the lines of $5, and they would be earning money for their game rather than having it sit in the closet collecting digital dust. And, critically, it would give fans of Miitomo a nice way to remember the good memories we had as well as creating new Miis and Miifotos to share. That way, our Mii friends that we’ve come to know and love wouldn’t be gone forever. Please help us show Nintendo that we don’t want to say goodbye to our Miis and their world with the Forget Mii Not Campaign!